Successfully Added HDD MP4 Player - Included 80GB Hard Disk to your Shopping Cart. Incredible wholesale deal MP4 Player, with a IDE 2.5 Inch enclosure for a impressive 120GB of possible memory, and a 80GB hard disk already included and preinstalled for immediate use right out of the box. 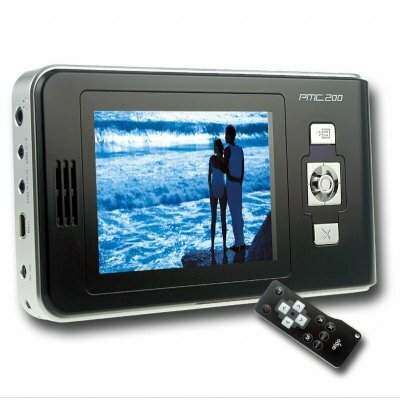 If flash memory MP4 players, with limited memory space for movies, music, and pictures are just not enough, this HDD PMP with a 3.5 Inch TFT Screen is exactly what you are looking for. It has impressive features, including vast amounts of native file format playing, great video resolution, AV and Y/U/V Output, a a USB OTG adapter for easy plugging in and recording from other USB devices such as cameras, loud speakers, 3 mini games, and more. So many uses, and even an included hard disk, make this a buyer and sellers dream, so order a sample from Chinavasion and move on to bulk orders for even bigger wholesale savings. Note: Please remember to format your Hard disk to the HDD enclosure if you change to another Hard Disk, or they will not work together..